Lupins are important grain legume crops that form a critical part of sustainable farming systems, reducing fertilizer use and providing disease breaks. It has a basal phylogenetic position relative to other crop and model legumes and a high speciation rate. 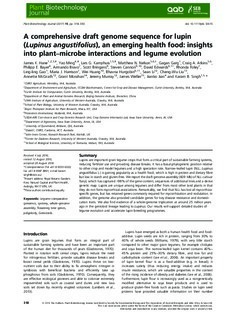 Narrow-leafed lupin (NLL; Lupinus angustifolius L.) is gaining popularity as a health food, which is high in protein and dietary fibre but low in starch and gluten-free. We report the draft genome assembly (609�Mb) of NLL cultivar Tanjil, which has captured >98% of the gene content, sequences of additional lines and a dense genetic map. 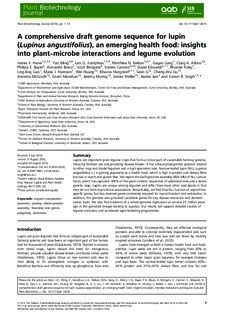 Lupins are unique among legumes and differ from most other land plants in that they do not form mycorrhizal associations. Remarkably, we find that NLL has lost all mycorrhiza-specific genes, but has retained genes commonly required for mycorrhization and nodulation. In addition, the genome also provided candidate genes for key disease resistance and domestication traits. We also find evidence of a whole-genome triplication at around 25 million years ago in the genistoid lineage leading to Lupinus. Our results will support detailed studies of legume evolution and accelerate lupin breeding programmes.